Maintenance-free UPVC fascias, soffits, roofline products, and more! When you have new windows, doors or a conservatory installed, it pays to look upwards and check the condition of your roof-line products. Traditional fascias, soffits, barge boards and cladding can wear quickly, diminishing the look of your home. How ever well prepared it is, timber cannot resist the worst of the British climate. Driving wind, rain and frosty conditions all take their toll on wooden roof line products, no matter what type of protection is used. This causes them to rot, swell, warp and crack, eventually wearing them out completely. That’s all before you consider the threat of attack from wood-boring insects! For most homeowners, the annual cycle of maintenance (sanding, filling, priming, painting, etc.) is a lot to keep on top of. A much easier solution is to go with new, durable PVC-U trim. With this stylish alternative available from Mister Window, you the can forget about the annual maintenance chore! 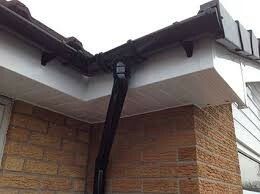 Our UPVC fascias, soffits and barge boards stay looking good for years. They’re not susceptible to rot, warping or insect attack, and never need to be re-painted. A quick wipe over with warm soapy water is all you need to retain that ‘as-new’ appearance. Mister Window roof-line products are designed to match the overall look of your home. Whether you bought your new windows, doors, or conservatory through us or not, we have plenty of colours and styles to match your existing design. Keeping the overall look consistent will improve your home’s kerb appeal and help to add more value. Mister Window have installed high quality roof-line products for years, and have many happy customers across Cardiff, Swansea, and the rest of South Wales. Nearly all of our work come from word of mouth, which is testament to the great job we do.